Purified air gyms are trying to offset air pollution in China, In-Shape Health Clubs launches a cancer-fighting fundraiser, IHRSA’s next Women’s Leadership Summit announces panelists, and more. We delve into IHRSA Chair Jim Worthington’s remarks to the President’s Council on Sports, Fitness & Nutrition, explore how fitness trackers are making their way into life insurance policies, and how one study supports screen-time during exercise. 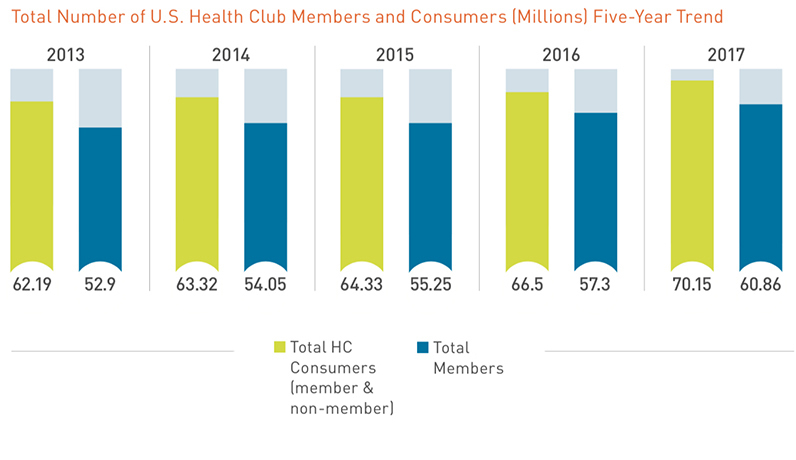 Learn more about the 2018 IHRSA Health Club Consumer Report. Since 2010, Oxygym has been gaining steam in Beijing by providing a solution to the city’s air quality problem, according to South China Morning News. The five locations are outfitted with air purification systems that improve performance by 30-50%, the gym’s founder, Vincent Li, said. He said he thought of the concept after running outside with an air mask while he was a university student. “The mask was black after my run. People didn’t know it was smog then. They just knew it was bad for health,” Li said. He then looked for ways to differentiate Oxygym from other clubs by supplying oxygen through nozzles next to fitness equipment and workout areas. Li’s goal was to “turn the gym into a forest” and provide a space that feels healthy. Jim Worthington, owner of Newtown Athletic Club and IHRSA board chair, met with his colleagues on the President’s Council on Sports, Fitness & Nutrition (PCSFN) on September 21 in Washington, D.C. The council discussed their efforts and their push to develop a detailed National Youth Sports Strategy. In-Shape Health Clubs has launched its 4th annual Fight Cancer campaign for the month of October. Since 2015, the clubs have used the campaign as a way to rally around a cause that helps the community. It’s been growing ever since. The health clubs plan to raise $150,000 in 31 days, a 15% increase from last year’s contribution. 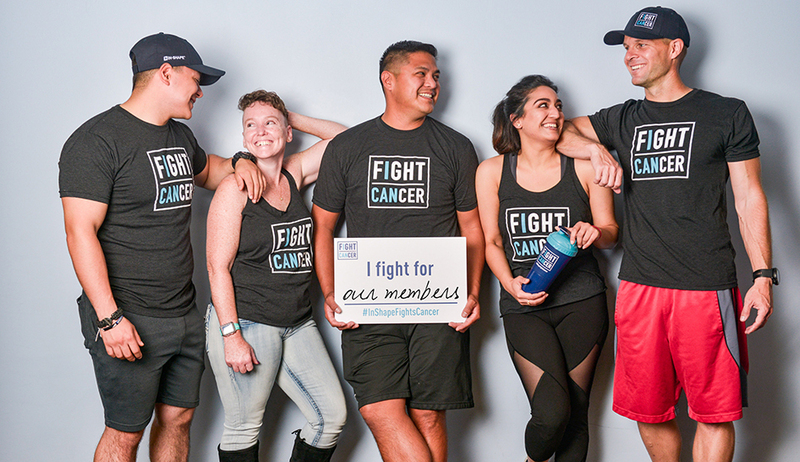 To reach the goal, In-Shape clubs will be holding donation-based fitness events, sell paper kettlebells, and donate $1 every time a new member joins or when someone posts to social media using the hashtag #InShapeFightsCancer. The proceeds will go to local cancer research organizations and the American Cancer Society. “October is my favorite month at In-Shape. Our team members and members enthusiastically drive this campaign to be bigger and better every year. #InShapeFightsCancer is the perfect example of what In-Shape does best,” said Francesca Schuler, CEO of the health clubs. Les Mills, an In-Shape partner, will also host fitness events at other clubs to help reach the goal. Read more about the In-Shape campaign. An impressive array of experts and influencers will lead the IHRSA Women’s Leadership Summit, hosted by Athletic Business, on November 8 at the Ernest N. Morial Convention Center in New Orleans, LA. Panelists plan to discuss business strategies, leadership tips, and a range of relevant topics and issues affecting the fitness industry. Bringing in years of experience to the panel discussion are moderator Chantal Brodrick, the host of The Fitness Podcast; Stephanie Coulon, 20-year veteran of Stone Creek Club & Spa; Sandy Franco, the owner of Franco’s Athletic Club & Spa, which received IHRSA’s Outstanding Community Service Award in 2013; IHRSA’s own Helen Durkin, J.D. ; Trina Gray, who is the 2018 IDEA Fitness Leader of the Year; Jill Kinney, the founder of Club One and Active Wellness; and Michele Melkerson-Granryd, a current member of the IHRSA Board of Directors and the general manager of Castle Hill Fitness 360. Henna Inam, who is a global speaker, author, and CEO of Transformational Leadership Inc., will set the tone for the event as the keynote speaker. Read more about the panelists. A recent study out of The University of Ottawa suggests that listening to music or watching a favorite show while exercising can have a positive effect throughout the day, The Washington Post reports. Researchers studied the food consumption and activity level of two dozen teenage boys after they exercised while also watching a show and found no negative impact from the midmorning stride. Other somewhat similar studies suggested that watching TV encourages snacking and continued inactivity, while another found that people move less once they performed an exercise for the day. The new study challenges those results. For the third year in a row, IHRSA is on the hunt for the next batch of impressive and influential professionals in the fitness industry who are under 35 years old. IHRSA selects rising stars from a diverse collection of applications to help bolster young talent, who we’ll profile in Club Business International and on social media. Last year’s class of Rising Stars was a diverse bunch, ranging from a general manager in New York to concept director in France. We also recognized professionals in sales, personal training, marketing, and business development from both health clubs and supplier companies. Know someone who fits the bill? Submit a nomination by November 15, 2018. Read more about the IHRSA Rising Stars and submit a nomination. John Hancock is incorporating fitness tracking technology into all life insurance policies provided in North America, the BBC reported. The company is incentivizing the policy by giving discounts and other rewards to policyholders who sign up to wear smartwatches and other wearable devices and meet exercise goals. While facing scrutiny from privacy experts, the company’s data suggest that holders of the policy live longer than those who do not. Read more about fitness trackers in the insurance industry.